If you haven’t notice already, I am a real estate lover and would love to own a piece of property in the places I love. One of those places would definitely be Santa Fe, New Mexico. The richness of culture and old world charms has to be the most unique traits of Santa Fe. Not to mention the warmth and bright day light are wonderful gifts of nature. New Mexico Real Estate is beyond the normal suburban life. It has so much to offer someone who wants a change, or who wants to trace back to their roots. For me it doesn’t hurt to dream and set goals, but for those who are ready to invest, ready to move on to an adventure, KnowingSantaFe.com is a great place to start your search. They are the experts in the Santa Fe Real Estate market and will help you find a place to settle. Working with total strangers sometimes can be intimidating, but you don’t have to feel that way if you check out the realtors on their about us link. There you will meet Ray Rush, Tim Van Cam, and John Rigatti. They all have spent years in real estate and the finance area. Reading about them gives me comfort knowing how much they love the area and lived there so long. The longevity has enabled them to foster great relationships with specialists in the area such as appraisers, lenders, and local businesses. Ray and Tim are realtors who specialize in luxury residential and commercial real estate. Whether it is luxury real estate or commercial properties you are after, Knowing Santa Fe Real Estate has the knowledge and expertise to assist you. 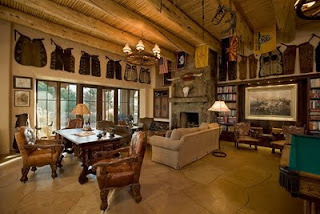 If you want more information about Santa Fe Real Estate hop on over to Knowing Santa Fe Real Estate. The following paragraph was copied from the website itself to show you some of the information available on KnowingSantaFe, but there is much more to learn about the area and it’s richness of culture and old world charms that you should check out for yourself. A long time ago, I thought New Mexico is such a great way to move to, and your information confirms my desire! I am originally from wild west in Arizona and I have been to beautiful Sante Fe! The best place for amazing sunsets. Following you from bassgiraffe hop. I would love to have a vacation home in Santa Fe. New follower from Almost Friday. Hope you follow back. New Mexico is definately on my list of places i'd love to visit! The pic you shared of the house is beautiful! Stopping by from Sunny Sunday and following on GFC and your other links! found ya on a helicopter moms alexa hop. Sharing the alexa love, please take a min right now (real quick) to comment back on my blog, locomotion of expressions, i have a linky you can find on my left sidebar (the picture of the tiger .. click it!) as well as a ton of giveaways in my july archives, if you have time. Thanks!